Last month, Brian drove our family past a most unusual building. especially in comparison to the boring suburbs surrounding the area! This place has captured my attention. Talk about a creative outlet! While I'm chopping clothes apart, someone has made a totally awesome creation. It's very impressive....but those monks don't have kids, I bet. Lately, the kids and I take a 30 second detour and pass it when we go to the sitter's house. We have been calling it the Chinese Palace. I often pull over and we check out the grounds to see if there's anything going on. One day Joshua spotted a "palace guard mowing the grass", which we all thought was hilarious! I did a little bit of digging to find out exactly what this place was about. I started with facebook. ha! Brian's boss was kind enough to post some links about the place to my facebook page. She lives very close and has watched it evolve over the years with many coats of paint. It's actually a Laos Buddhist temple located about 4 miles from my house. The temple includes an ornate and distinctive ceremonial hall set in the middle of 60 acres. Festivals are held inside the temple about 12 times a year and several large festivals during the summer months raise money for the monks who live there. 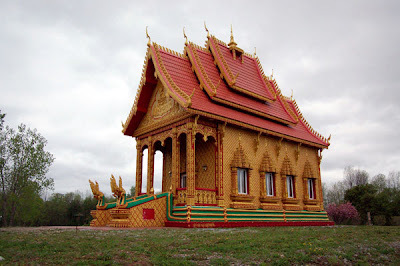 RocWiki has a short page about the Wat Pa Lao Buddhadham Temple. The Rochester City Newspaper had an article describing some community concern over the summer festivals that are held on the grounds.